NO SWEAT™ reusable and removable oversized insulation wraps for valves with extensions come with a 1" thick flexible fiberglass insulation blanket that is used to insulate the installed valve. The outer cover is made of DuPont Tychem® QC. It easily stretches around the insulated valve and is secured with a Velcro closure. 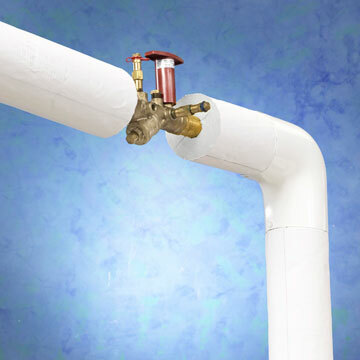 Oversize Insulated Valve Wraps are only available in the above "d" lengths. (10", 14", 16" 18" 22" 42").